Don't (Or Do) Forget Those Other Basketball Tournaments! 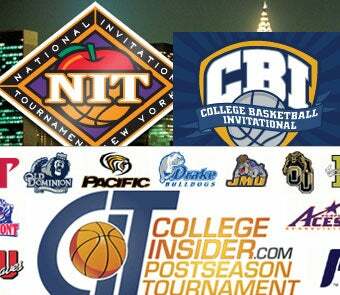 There are three—three!—other postseason tournaments now that are not the NCAA tournament? Why is that again? Imagine you're on one of these teams. Your season is over, most likely in an extremely disappointing fashion. For the first time all year you're probably looking forward to going to class simply so it will take your mind off basketball for a few days. Heck, you could even go to South Padre for spring break this year! But instead you have to get on a bus and go play Austin Peay for reasons that will never be explained to you. I suppose the reason is money, but none of your fans will pay to see this game so how does that help you? Three more schools get to finish their seasons with a win and a bittersweet reminder of what could have been. Hoo-ray. And I used to think that football bowl season was sad and pointless. Let's do everyone a favor and end this charade, okay?